I stayed away pretty much from scanned 'manga' or comics as I find it pretty boring cause it's not animated. As the age gets me, I crave more for easy fix and fast funny cartoons to flush the pressure of daily chores aka the sacred J.O.B. It beats the crap of me when my housemate stood fixed in front of her machine reading scanned manga and spending few hours just for that. Hmm..what grabbed her attention? She must have plugged her ears when I constantly yap about how mundane it is to read scanned manga all this while.haha. However, what strucked me to read one myself is because of 'Scent of a Woman' drama starring Kim Sun Ah and Lee Dong Wook. Nope..I'm not gonna review the drama as Dramabeans is doing a fine job on the recaps. And..oh wow..what a fine drama 'Scent of a Woman' is. Two thumbs up and it definitely change my perspective towards life! A must watch!! 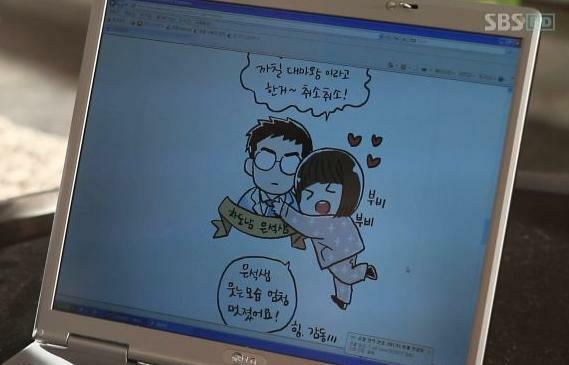 My favorite character in the drama is none other than the doctor - Eun Seok and the girl; Hee Joo who was infatuated by him. She, started up a series of webtoons about the doctor as the picture below and from here on my curiousity peaked and checked out Naver immediately for webtoons. Some webtoons from Naver need access to read and some are for public. My first webtoon read titled '우연일까?' means 'is it coincidence?' which appears every Friday. The synopsis tells 우연일까? 운명일까? 가슴 설레는 사랑 이야기가 찾아옵니다. - Is it coincidence? Is it destiny? Come for a love story that makes the heart flutters. The best part of reading the webtoon is, I could familiarize myself with the non-standard Korean writings. It's easy to read standard Korean characters but it gaves me headache to comprehend normal Korean writings. It seems like doctors' scribbles! Hahaha..sorry doctors.